St. James Church, an Episcopalian house of worship built in the 18th century, is only authorized to bless civil ceremonies, the father of glam rock and the glamorous Somali-born model were first wed in Lausanne, Switzerland before celebrating their union in the edifice referred to as Florence’s “American Church”. The cathedral rang out with tunes penned by the groom during nuptials which combined elements of both the Christian and Muslim faiths. 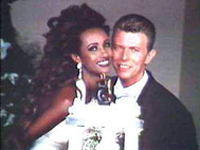 Bathed in candlelight, Iman stood at the altar in a body-conscious white halter gown designed by Herve Leger. The dress was complimented by diamond and pearl drop earrings, white opera gloves and a cascading bouquet of white starburst lillies. Without a veil the bride’s dark locks, worn in an upswept hairstyle with a multitude of tendrils framing her face, were her crowning glory. Ever the fashion plate, the groom opted for a Thierry Mugler tuxedo, paired with a white bow tie. Yoko Ono and Bono from U2 were among the sixty-five attendees who watched the tranquil waters of the Arno sparkle from the fireworks which lit the night sky over the 16th century Villa La Massa Hotel, where the former Ziggy Stardust danced the night away with his new bride.